Water Convolvulus (or Water Spinach) is also known as Kangkong in the Malay Language. It is a common vegetable found in abundance in Malaysia and has nutritional values similar to the spinach. In Malaysia, it is often served as Kangkong Belacan (stir-fried with spicy shrimp paste) or Sotong Kangkong (mixed with cuttlefish in fish paste and sprinkled with crushed peanuts). It is very easy and fast to cook. You should ideally have a cooker with high heat as it is imperative that this Kangkong Belacan dish be cooked as fast as possible. Otherwise, it will be flooded with juice from the vegetable and watery. 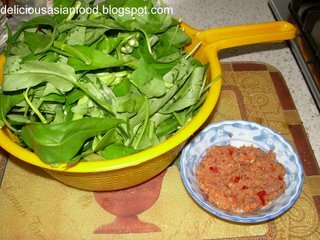 This is my recipe for Kangkong Belacan. Hi! How can you get that bright green color? 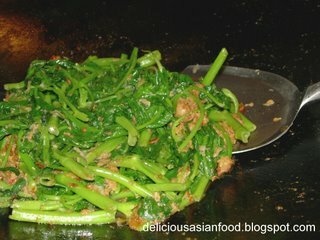 When I do this dish my kangkong turns a very dark green. Hope you can share your method. Thanks! We love this dish!!! We actually made this recently, but your idea of pounding the chiles, belacan in shrimp is great!